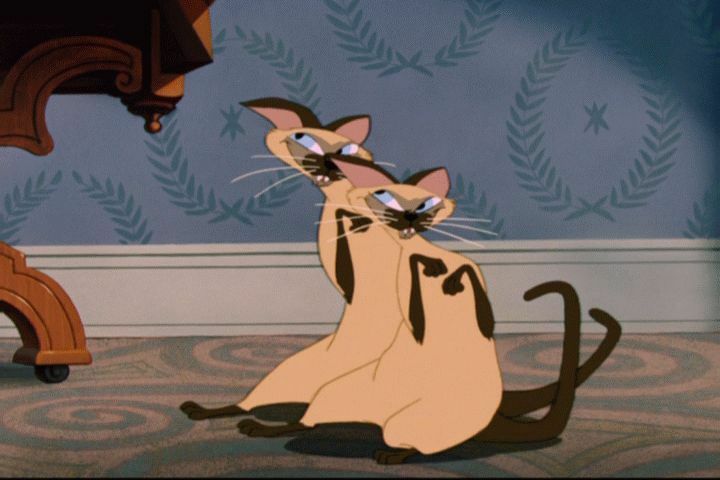 Last night John was whistling a song that was not, but reminded me of "We Are Siamese" from Lady and the Tramp, and it gave me cause for reflection. It's been a while since I saw that movie, so my memory of the details is fuzzy, but I do remember the cats being cast as villains, and I guess they were jerks to Lady, and they are too skinny to be really awesome cats, but EVEN SO: give me a bossy, manipulative cat over a doormat Cocker spaniel and a commitment-phobic mutt any day. Plus Tramp has, like, a terrier's head? What is that all about? Imagine him in real life--he would be hideous. He's a hideous cartoon! Get out of here with that. I hate Lady, I hate Tramp, I hate Jim Dear and Darling and Aunt Sarah and that stupid spaghetti dinner and it feels so good to say that! I had no idea my feelings about that movie were so strong. I just watched the first episode of iZOMBiE, which I have never heard of because I am an old person who is out of the loop, and it's quite a cute little show. I'm starting to get just a little bit tired of the zombie craze--it's nearing bacon levels in overexposure--but I liked this show. We are thinking about getting another cat, and I know I said we could not be a three-cat family, I am choosing to pretend that three cats does not cross the line into animal hoarding. It's a little female tuxedo cat who purrs the second you pick her up and as Grant puts it, "We NEED that cat." John and Emmett do not want the cat, because John doesn't want any cats ever, and Emmett is strange. John feels like we don't need another potential generator of poop and pee and barf in the house (Groceries has done his species some terrible harm, P.R.-wise, with this) and Emmett won't give a real reason for why he doesn't want the cat. He loves Groceries and Rex, so I'm not sure what's going on, other than he is my only child who understands moderate portions, and maybe he understands that three cats is an excessive portion. But that's only one cat for every two people in our house, so really I'm rightsizing our cat levels. what happened to us, kodos? I first heard about roller derby from John--he watched it in the seventies when it was basically professional wrestling on skates. It's much different now--not scripted, and it's a real, no-foolin' sport. You should see the things these ladies can do on skates! One of them can jump a folding chair. Probably more than one! I am very impressed by them. Anyway, I'm having a great time and it has brought balance to my life and helped me chafe less in my traces. I'm still in fresh meat because I am a slow learner. It's scary and wonderful and I love it. You guys, roller skates are fun. If you live in or near the Ogden, UT area and want to be part of something unique and challenging and rewarding, I highly recommend it. And if you don't live around here, chances are there's a league in your area that would love to have you. I just googled "roller derby in Utah," and here we are.